Happy happy Wednesday everyone. Hope your well and had a lovely weekend? It was a very long one for me as I was on the Step-By-Step course with the UKAWP (UK Alliance of Wedding Planners). Was very well tutored and extremely useful so will recommend it to everyone. As today was such a beautiful day I thought I would create my first design board and see if you like it as I very much enjoyed creating it. 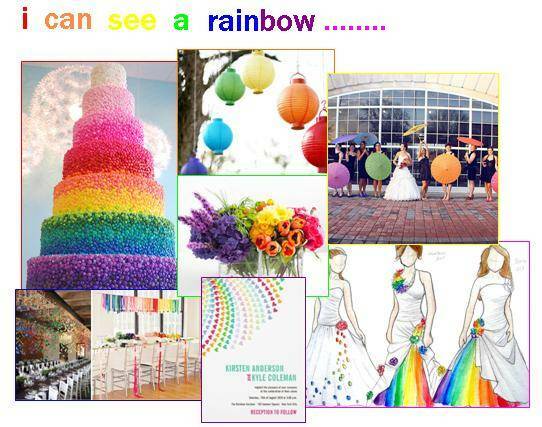 So back to it being such a gorgeous day I decided to talk about the speculated Rainbow Theme. This theme comes and goes all the time, though you don’t see alot of it as it’s not very common as couples either find it to much to handle or just think it’s too tacky! Well not everyone can get away with it that’s why is so complimentary. I wanted to show you all my take on this theme as not only is it a fairly easy theme as you don’t have one accent colour to choose from you need as many colours as possible to make it work which brings a great atmosphere and originality into your day. You don’t even just need one shade of each colour you can have as many as you like! This is one of the reasons I find it such a captivating theme because your imagination can run wild or literally run away with you. The colours are not just it, it’s such an easy design/theme to create as you can literally use anything as long as your keeping to the theme. So no late nights worrying what to put on tables and worrying to keep everything samey as you can use a mixture of different coloured flowers, coloured crocklery, old vintage tea sets, old sweet jars all just for example, of course this list can go on……..
Another reason it is such a good theme is the budget which comes with it as you won’t be spending as much. For example all the flowers will be different and not just one type so instead of using all peonies and roses you can have a mixture of tulips, gerberas, freesias, roses etc. As well as the flowers each Bridesmaid will not only be happy as they can have a colour that suits them but they can each wear one of their own dresses. Of course you can go all out with this theme but it also is one of the best ones to have a budget for. The flowers of course for me would be the highlight of this theme as you can quite frankly go crazy well not too crazy because you still want to keep it all in unison. Look at the photo below and you can see why I love it as you can use a different bouquet of flowers for each Bridesmaid which works extremely well especially as each of them are wearing a different coloured dress (I can see your imagination running away). Using this many flowers you would normally get a look down gaze for even just suggesting it, but for this theme it would be considered a masterpiece. 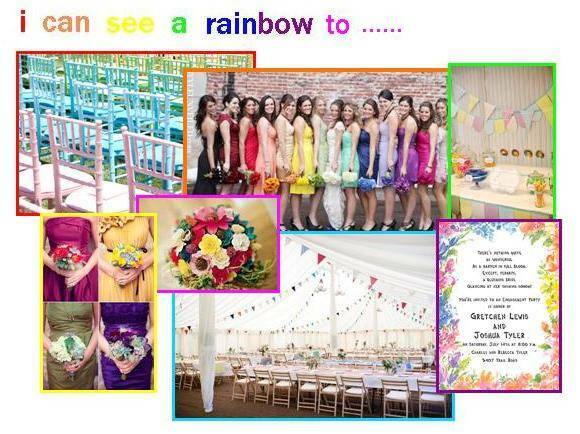 The design of your Rainbow Wedding can take you to each end of the Rainbow itself creating something so colourful and magical so each guest will remember your wedding forever….. There has been alot of speculation about this theme and even though it is like marmite it deserves to be up there as one of the more creative wedding themes. Watch out for next week where I will be creating something completely different. Until next time my lovely beautiful people. P.S. This post would not of been successful for the following websites. All my thanks and gratitude to the following for the photos above.